"In the speech, he laid out a menu of policy options that are available to the monetary authorities at the zero bound. First, aggressive currency depreciation, as per Romer's analysis of the end of the Great Depression. Second on Bernanke's list is the introduction of an inflation target to help mould the public's expectations about the central bank's desire for inflation. He mentions the range of 3-4%!" I think you will find this week's OTB to be exceptionally thought provoking. Montier is one of my favorite economic thinkers (and a good friend). He works for Societe Generale in London in their Cross Asset Research group. In the face of this uncertainty I decided to return to history and see what it has to say about the way out of a depression. My first point of call was Irving Fisher's "The debt-deflation theory of Great Depressions" published in 1933 1 . Fisher is probably most infamous to those in finance for his pronouncements of a new era of permanently high stock prices in 1929. But in the wake of his disastrous calls he turned to trying to understand the experience of the depression. Incidentally, he also invented the Rolodex. The good news is that Fisher is also very clear on how to end a debt-deflation spiral: "It is always economically possible to stop or prevent such a depression simply by reflating the price level up to the average level at which outstanding debts were contracted by existing debtors and assumed by existing creditors... I would emphasize... that great depressions are curable and preventable through reflation and stabilization". The irony of Fisher's route out of deflation is that, probably only the Fed - after helping lead us into this mess 2 - can now get us out of it. Romer wrote a paper in 1992 3 arguing that fiscal policy was not the key driver in the recovery from the Great Depression. Not because fiscal expansion is ineffectual per se, but rather because the fiscal stimulus that was conducted wasn't large. As Romer notes "When Roosevelt took office in 1933, real GDP was more than 30% below its normal trend level... The deficit rose by about one and a half percent of GDP in 1934". The final source for signposts to watch comes from a speech given by Bernanke in 2000 to Japanese policy makers. As I wrote in Mind Matters 6 January 2009 , in this speech Bernanke clearly acknowledged the greater threat that deflation poses in a highly leveraged economy, "Zero inflation or mild deflation is potentially more dangerous in the modern environment than it was, say, in the classical gold standard era. The modern economy makes much heavier use of credit, especially longer-term credit, than the economies of the nineteenth century." Bernanke clearly believes that monetary policy is far from impotent at the zero interest rate bound. In essence his argument is an arbitrage based 4 one as follows "Money, unlike other forms of government debt, pays zero interest and has infinite maturity. 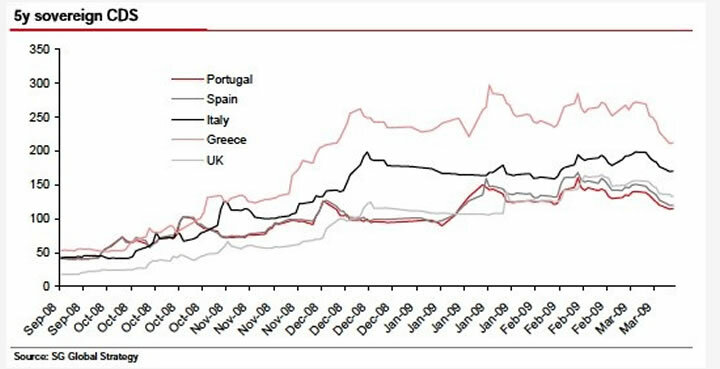 The monetary authorities can issue as much money as they like. Hence, if the price level were truly independent of money issuance, then the monetary authorities could use the money they create to acquire indefinite quantities of goods and assets. This is manifestly impossible in equilibrium. Therefore money issuance must ultimately raise the price level, even if nominal interest rates are bounded at zero." The first prong is cash. 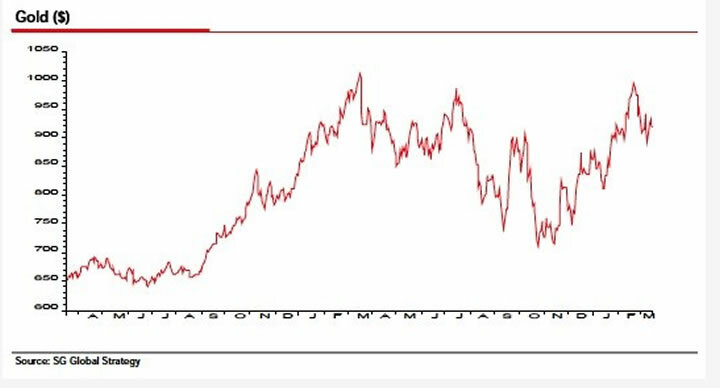 This is a legacy from the lack of opportunities that characterised markets in the last few years. But it is also a hedge against outright deflation. 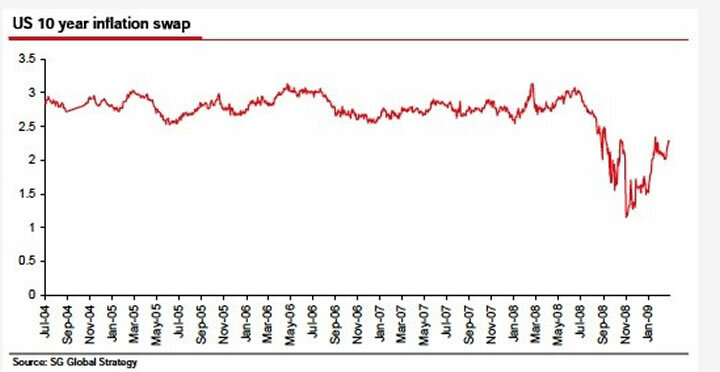 The second prong is deep value opportunities in both debt and equity markets (as detailed for the equity markets most recently in Mind Matters, 4 March 2009 ). The third element is sources of cheap insurance. The idea behind this element of the portfolio is to prepare for a wide variety of outcomes by buying cheap insurance (which ideally, although not always, pays off in multiple states of the world). Of course, it should be noted that the purchase of cheap equities also contains an inflation hedge element. The second of the pure inflation hedges comes via the inflation swap market. 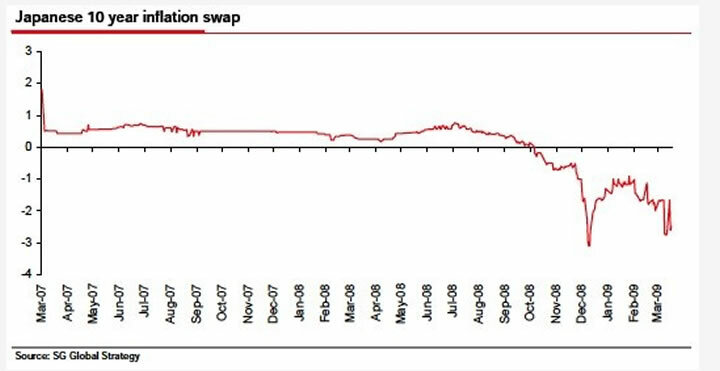 The charts below show the zero-coupon fixed rate necessary to build a swap against zero-coupon CPI appreciation over 10 years. 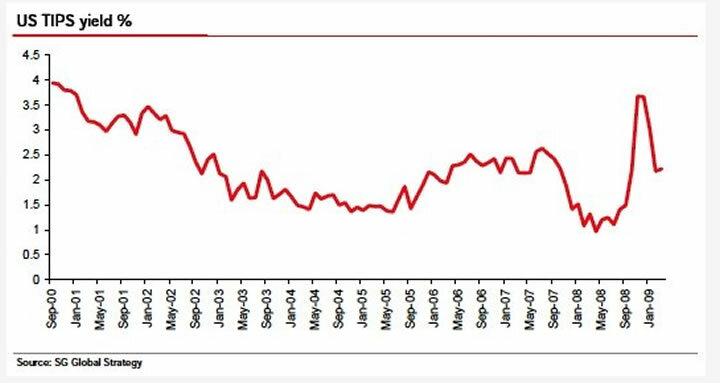 When I first looked at the US version in January (see Mind Matters, 6 January 2009 ) the rate was a mere 1.5%. Today it has risen, although not dramatically, to 2.3%. 2 See Bill Flecksenstein's excellent book, Greenspan's Bubbles or John Taylor's insightful paper The Financial Crisis and the Policy Responses: An empirical analysis of what went wrong, available from http://www.stanford.edu?~johntayl/FCPR.pdf , or any of Albert Edwards' myriad of rants on Greenspan.